September | 2012 | seedLinG! Crocus flowers are among the first to herald spring, sometimes popping their bright blooms through the snow. Fortunately, we don’t have to wait till spring to enjoy these glorious flowers. Growing crocus indoors is easy to do by forcing them into bloom mid-winter. Start the process in fall — October is an ideal time. A crocus bulb is actually a corm. Corms produce beautiful cup-shaped blooms in purple, lavender, white or yellow — plain or striped — each with a bright orange stigma. All have slender, upright leaves that are green and white striped. Dainty and lovely, they smell like a whisper of spring. 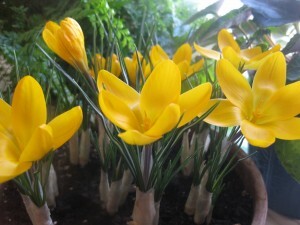 HOW TO PLANT: Crocuses need a cold treatment for 12 weeks to bloom. -Choose a shallow pot (at least 4 inches deep) with drainage holes in the bottom. -Fill the pot loosely with potting mix. Set several corms side by side — close but not touching — pointed end up. 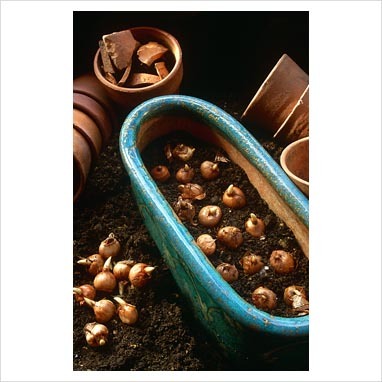 -Set corms so that their tips are even with pot rim. Do not press the corms into the mix. It should be loose so the roots can grow through it easily. -Cover with additional potting mix until just barely covered. -Water thoroughly and discard extra water that trickles out. -Move pot to a dark, cool, but not freezing, (40°F) location such as a basement, unheated garage or refrigerator. I like to use my empty crisper drawer for this. Avoid storing corms near fruit or vegetables which give off ethylene gas which can damage the corms. -Keep them in cold storage for 12 weeks—mark your calendar. -Keep the soil barely moist to the touch, sprinkling with cool water once every other week or so. -Once your plants start to sprout, help them acclimate to your home. When shoots reach about 2 in tall, bring the pot out of cold storage and place it in a slightly warmer (50°F) location with low light intensity—a garage, a porch, a drafty window, a basement. -Over the next few days, gradually move it toward a sunny window. -You can turn the pot every day for even growth. -Water sparingly until growth appears, then water enough to keep soil evenly moist. Flowering plants are thirsty, so check them often. -When in full bloom, keep crocuses out of direct sun to prolong the blooming time…and enjoy! TO PURCHASE CROCUS BULBS and support the Cortland Preschool Fall Fundraiser, CLICK HERE! All purchases are guaranteed, and orders of $40 or more get $10 in free daffodils! Click here to enjoy tips and tricks, how-to info and everything bulb! Three different parents recommended the Toilet Training in Three Days Approach, which uses lots of repetition and rewards to get your child toilet trained in a short (though rigorous) span of time. There are many different books and websites on this, we linked to one of the more “friendly” versions. Parents also suggested that you make small modifications as needed–one Mom felt that her child needed sleep more than training at night, and didn’t do the nighttime wake-up calls. Another modified some of the rewards to better suit her daughter’s tastes. In talking with these parents, it sounds like the repetition and the manner with which you train is more important than every tiny detail. Another parent reported that when toilet training her three children (who have an age span of 18 years total! ), she talked with each child about putting them into underpants and then they “just did it.” The children all had a few accidents, but she didn’t rush to immediately change them, instead letting them feel the discomfort of wet clothing against their skin for 5-10 minutes. I’m sure parents will tut-tut this one, but she said her children learned quickly that they preferred the feeling of soft, dry clothing to cold, sticky, wet clothing and trained in a week or less. A new Cortland family recently recommended “Elimination Communication” as a method for early toilet learning. This is very common in other countries, and is catching on in the US. Read more here, it is very worthwhile! When children have accidents at preschool, we quietly take them to the restroom and help them clean up and change into clean, dry clothing. We talk about being the “boss of our pee-pee’s” and when the pee-pee needs to come out, we quickly run to the restroom. Having an accident is no big deal, we all make mistakes when learning something new, and children re-enter the classroom happy, dry, and hopefully a little more in control next time. We also talk about common fears: the sound of the toilet flushing, the fear of falling in, the fear of getting “flushed down the hole”…these are very real fears for children, and the more you can logically illustrate that these things are not bad or scary (take the lid off and show what makes the sound, make a circle of paper the same diameter as the hole so your child can hold it and see he or she is much too large to fit, etc.) the better your child will feel. Time, patience, kindness, love. And don’t forget to flush and wash up! In order for your child to fully participate in our classroom environment, it is important that they are toilet trained. *Able to remove his/her pants and underwear with minimal prompts from a teacher. Elastic waistband pants for both boys and girls are HIGHLY recommended for the first 4-6 months following toilet training. Children are able to build confidence and success when they can easily pull clothing up and down at school. Children should wear clothing for comfort, messy play, and utility at school—keep the fancy stuff for home! Occasional accidents are developmentally appropriate at the preschool level. Teachers will compassionately help your child change out of any soiled clothes and into clean and dry clothing if they have a toileting accident. No big deal, sometimes accidents happen. Thank you for working with us to help your child gain new skill sets, independence, and a feeling of success! If you believe that your child needs help in any of these areas, Cortland staff is happy to offer suggestions and work with you. We value your thoughts and candor. …thanks to West Bucktown Neighborhood Association and specifically the talented writer, Deborah Bottjer, for allowing me to share this info. They say the grass is always greener on the other side of the fence. But nothing could be further from the truth at the West Bucktown home of master gardener Kristina Risvold and Ron Forsythe, where “green” is as much a state of mind as it is a color. The husband and wife duo recently launched Upward Ground Vertical Gardens, a start-­up business dedicated to transforming small, urban outdoor areas into beautiful and beneficial green spaces. Not surprisingly, the idea for Upward Ground grew out of the couple’s own passion for sustainable, low–maintenance landscape design. Many homeowners view the small patch of grass on a typical 25 x 125 city lot as something to covet. But not Kristina and Ron, who shunned the traditional “outdoor carpet” in favor of a lush mix of primarily native plants, flowers, herbs and vegetables. They designed and built their own custom planters to not only maximize their growing space and grow food free of pests and contaminants, but also to breathe new life into previously overlooked planting areas. Best of all, their garden takes just minutes a day to tend. Both Kristina and Ron see gardens as living works of art limited only by the imagination, and they created Upward Ground to give even novicegardeners a way to bring their vision to life. With a product line that includes vertical plant ladders, whimsical felted hanging pouches, double‐sided saddlebag pouches (perfect for deck railings!) and hydroponic living walls, Upward Ground’s unique gardening solutions help make every inch of outdoor space count. Kristina and Ron custom-­make each of their products locally using timber from reclaimed sources, and they can tailor their designs to meet customers’ exact specifications. 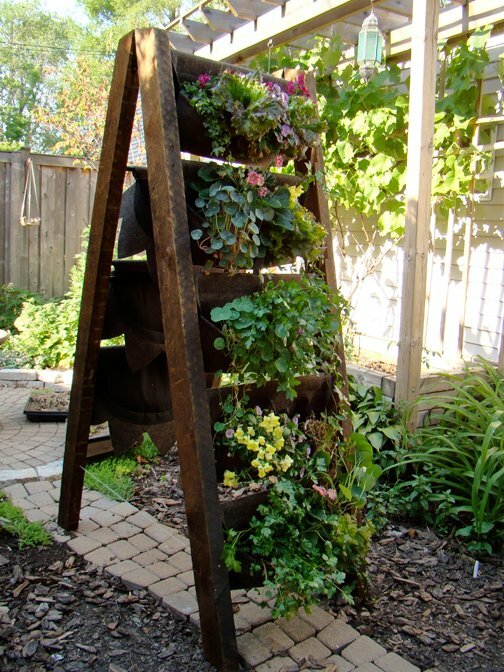 For example, their vertical plant ladder could also be constructed horizontally to accommodate small children or a gardener with limited mobility. Upward Ground recently debuted at the Logan Square Farmer’s Market and Green Music Fest in Wicker Park. To learn more about their offering or to place an order, visit www.upwardground.com. 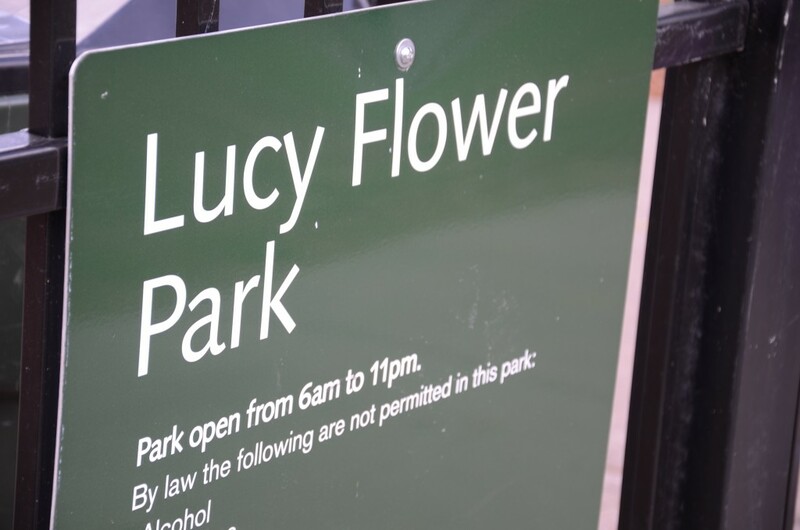 Quick poll: Has anyone ever caught themselves adding an “S” to the Lucy Flower Park name, calling it Lucy FLOWERS instead? It’s okay, we’ve been guilty of this once or twice ourselves. It’s an honest and all-too-easy mistake to make. In fact, if we had a dollar for every time someone has done this, we’d be well on our way to raising the necessary funds for the planned renovation of Lucy Flower Park in 2013. 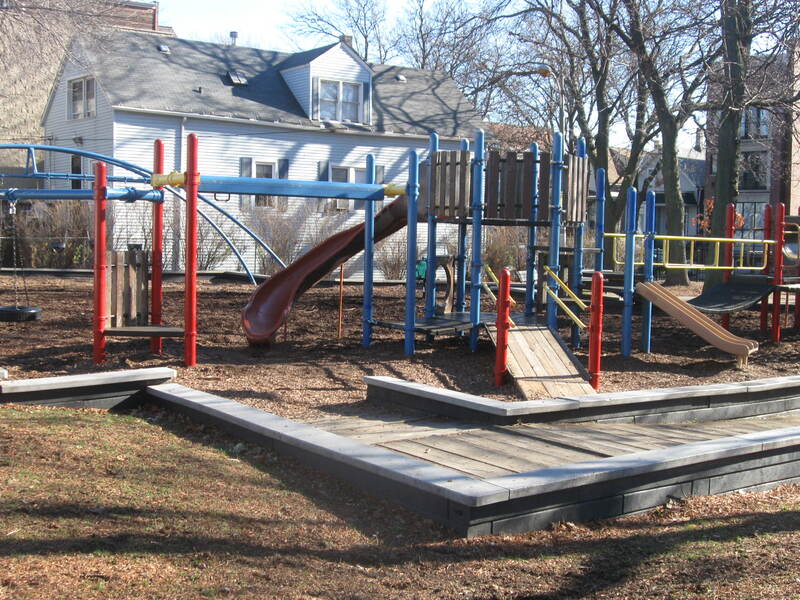 Thanks to persistent lobbying efforts of the Maplewood and Lucy Flower Parks Advisory Council (MLFPAC), the Chicago Parks District has agreed to foot the bill for $140,000 of the estimated $350,000 it will take to upgrade the park’s aging playground equipment (see below for project details). 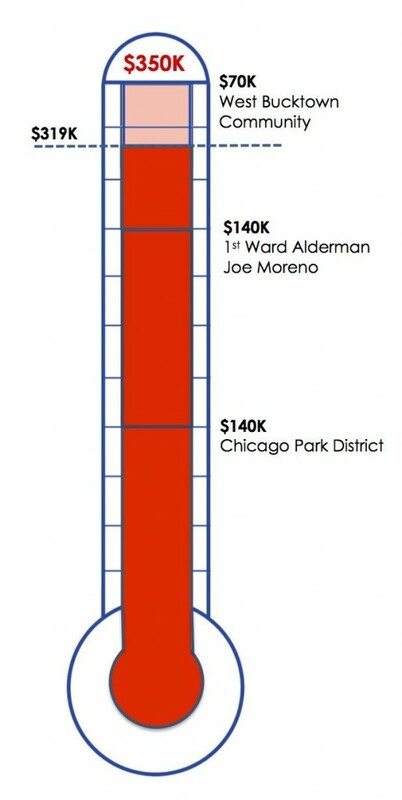 Another $140,000 will come from 1st Ward Alderman Joe Moreno, who has generously allocated a portion of his infrastructure menu funds over the next three years. So that leaves the West Bucktown community responsible for about $70,000. Fortunately, MLFPAC already has more than $38,000 in its coffers, thanks to previous fundraising efforts and community donations. Still, covering the shortfall of $32,000 will be a challenging undertaking for the neighborhood. Attend a fundraising event. The recent pizza-and-beer party at West On North raised just over $1,000 in the first of what will be many upcoming opportunities for us to come together as neighbors and friends to support the renovation project. (A special shout-out is in order for Joe and Laurie Sabath of West On North, who not only contributed pizza, beer, and raffle gift certificates, but also made a very generous personal donation!) Other planned fundraisers include the July 14th Yard Sale at Maplewood Park, a neighborhood block party in August, the annual MLFPAC fundraiser at Naveen’s Cuisine in November, and a Circus In The Park event next summer. Participate in the “Buy A Brick” program. Details are still being ironed out, but residents and area businesses will be given the chance to inscribe their names (or the name of someone they want to honor) on brick pavers used in the park. Want something even more high profile? Email us at environmental@westbucktown.org about other sponsorship opportunities, such as benches, planters, bike racks, and trees. Make a donation. Nothing will get us to our goal quicker than good ol’ cash! Consider this…if every household in the neighborhood was able to kick in just $10, we would be more than halfway to our goal in no time. But no matter how large or small, every contribution puts us a step closer to a new and improved Lucy Flower Park. Your tax-deductible donation can be made via PayPal – click here to be redirected to the WBNA website. Our Hidden Gem Will Really Shine! Much smaller in size and with none of the Park District programs of its big sister, Maplewood Park, Lucy Flower has long been considered the “hidden gem” of West Bucktown. That’s because what it lacks in square footage and organized activity, it more than makes up for with mature trees, plenty of summertime shade, and an intimate setting that makes it particularly attractive to families with small children. What’s more, in the last two years, the park has received grant money for raised beds and planter boxes, upgraded the water supply, and hosted a free Children’s Garden Club every other Saturday during the summer months. But despite this progress, according to a recent article in TimeOut Kids Chicago, Lucy Flower is among the 37% of Chicago Park District playgrounds that fall short of meeting national safety standards. During the most recent 2010 survey conducted by the Injury Prevention and Research Center of Children’s Memorial Hospital, a team of trained safety inspectors visited 477 playgrounds and graded them in four areas: age-appropriateness of equipment, soft-surfacing near play areas, equipment maintenance, and the overall physical layout of the space. Lucy Flower received a score of 58% – well below the 70% needed to meet national safety standards. In comparison, Maplewood Park (which was renovated in 2007) scored a respectable 84%. Not surprisingly, one of the biggest safety issues at Lucy Flower is the use of wood chips in the playground area. Not only are the chips dirty and unsanitary, they are also not as shock absorbent as newer surfaces made from rubber or rubber-like materials. And that translates into a potential for more injured children. While not included in the initial plan, there has also been discussion about installing some sort of water feature at Lucy Flower. Normally, this kind of enhancement would add upwards of $100,000 to the project estimate. However, the Park District is looking into ways to make the projected $350,000 stretch to cover a water feature, as well. We expect to hear more about the feasibility of this request in coming weeks and will keep everyone posted on the progress. Do a Little Good for the ‘Hood! 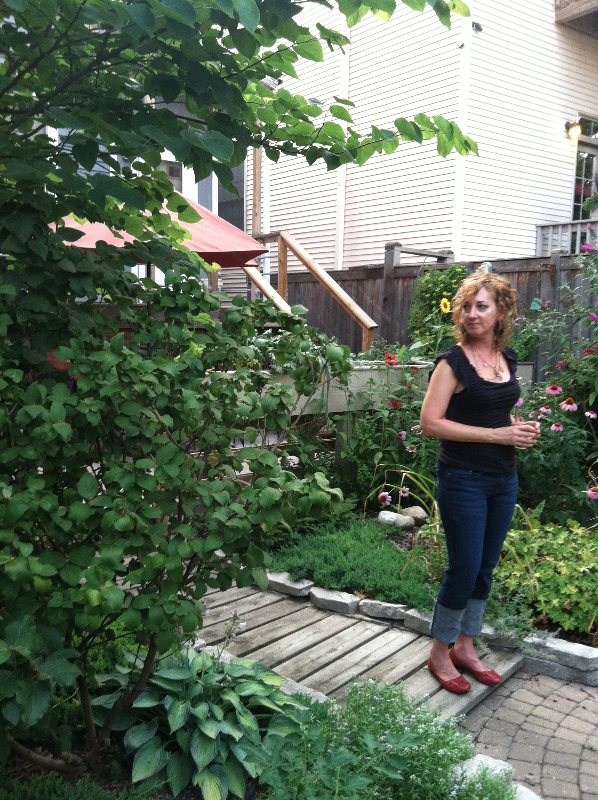 Take a walk through West Bucktown and you’ll see a fabulous mix of landscapes and gardens. There’s clearly no cookie-cutter approach to gardening in our little neck of the woods, and that’s a big part of what makes this community so diverse and wonderful. 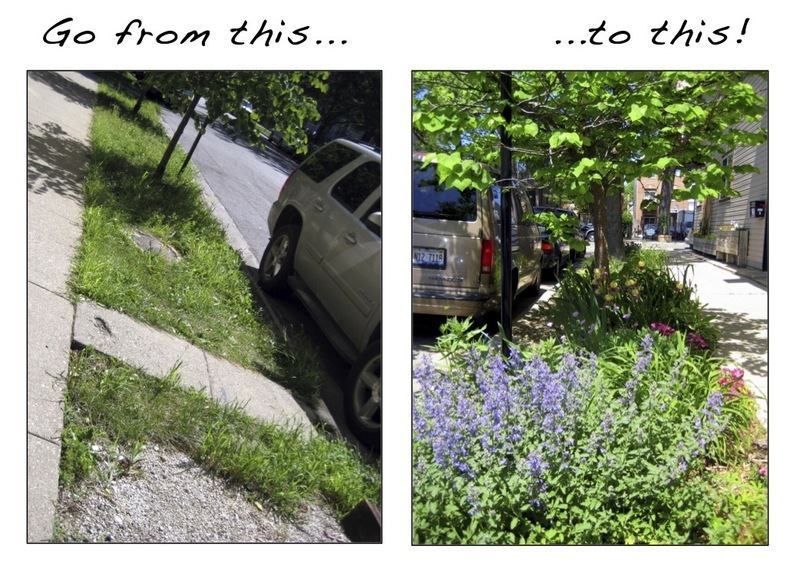 Everyone wants to live in a neighborhood that looks neat and well cared for, which is why we’re asking all West Bucktowners to take a few moments to survey their block and identify any areas that could use a little extra TLC. There’s nothing like “neighbor helping neighbor” to help build a sense of camaraderie and pride in West Bucktown. Don’t stop at your property line! If you already have the lawnmower out, it only takes an extra 5 minutes to mow your neighbor’s parkway or front lawn, too. Elderly residents and absentee landlords will appreciate it! Plant some seeds! If grass isn’t your thing, you can spend $3 on seeds at the local garden center and plant a few perennials (think “permanent”) that will come back every year. Cosmos do especially well in our area and provide a great splash of color. Or, if you’re just not ready to commit to a long-term relationship with your garden, Nasturtiums are a fun and pretty annual, especially for children. The leaves look like lilypads, or shields, and the flowers resemble little helmets. Go wild! Vacant lots and parkways don’t have to be an eyesore of overgrown grass and weeds — turn them into fields of blooming color with a handful of wildflower seeds. The WBNA has distributed seeds at our last few Clean-and-Green events — email us at environmental@westbucktown.org if you’d like a packet or two. Get creative! Look around at what your neighbors have planted and try to work within their color palate, share some plants, or extend a plot to meet another one (particularly on the parkways). You’d be amazed at what a difference a little time and love can make! Q: Do I need “permission” to mow or maintain a parkway in front of a vacant property, or in front of a negligent neighbor’s house? Q: Can I prune back the branches of a parkway tree that’s in front of my own property? A: Not without a permit. Permits must be obtained from the Bureau of Forestry, (312) 746-5254. Q: Does the city have any guidelines/ordinances about a homeowner’s responsibility for maintaining the parkway? Can fines be levied if a parkway is allowed to become grossly overgrown? A. Yes. According to Ordinance 10-32-050, the owner of a property immediately adjacent to a parkway is responsible for maintaining it in good condition, including weeding and/or mowing.Fines can be levied by our Streets and Sanitation Ward Yard Superintendent Manny Gonzalez. Q: If the city digs up a parkway for water/sewer/gas repairs, are they required to fix the grass or landscaping when they’re done? A: They are only required to restore by filling in the parkway. They are not responsible for any landscaping or decorations. Q: If the roots from a parkway tree cause damage to the sidewalk in front of my house, who is responsible for repairs? A: The city is, but normally such repairs are paid for through either the shared cost sidewalk program (also know as the 50/50 program) or from my annual aldermanic infrastructure menu fund.